Why is this site here, and what's it all about? Your questions are answered here! Learn how domain names are structured, and the uses and misuses thereof. 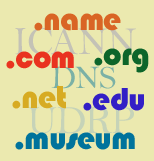 NEW: The third, and potentially largest, round of new TLDs gets underway in 2010! Accounts of some of the fights that have broken out over domains, and how to fight back if yours gets challenged. Can you fight a challenge? Yes, ICANN! Some hints and tips regarding domains, which didn't fit in the other sections. Giving commemoration or notoriety to those who use or abuse the domain name system in an exemplary or horrific way. This page was first created 18 Feb 2001, and was last modified 01 Mar 2012.